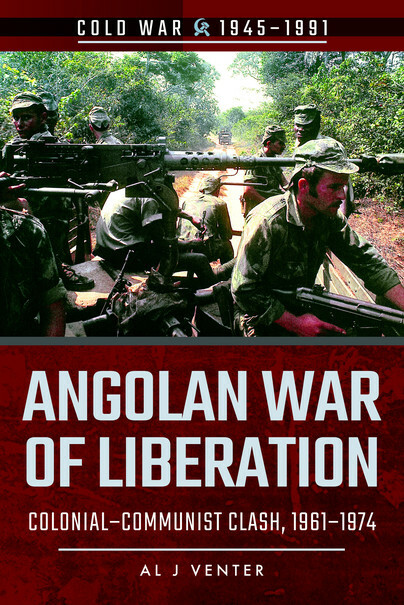 You'll be £8.99 closer to your next £10.00 credit when you purchase Angolan War of Liberation. What's this? When a large group of rebels invaded Angola from a recently independent Congo in 1961, it heralded the opening shots in another African war of independence. Between 1961 and 1974, Portugal faced the extremely ambitious task of conducting three simultaneous counterinsurgency campaigns to preserve its hegemony of Angola, Portuguese Guinea and Mozambique. While other European states were falling over themselves in granting independence to their African possessions, Portugal chose to stay and fight despite the odds against success. That it did so successfully for thirteen years in a distant multi-fronted war remains a remarkable achievement, particularly for a nation of such modest resources. For example, in Angola the Portuguese had a tiny air force of possibly a dozen transport planes, a squadron or two of F-86s and perhaps twenty helicopters: and that in a remote African country twice the size of Texas. Portugal proved that such a war can be won. In Angola victory was complete. However, the political leadership proved weak and irresolute, and this encouraged communist elements within the military to stage a coup in April 1974 and lead a capitulation to the insurgent movements, squandering the hard-won military and social gains and abandoning Portugal’s African citizens to generations of civil war and destitution. The Book described is really interesting, each chapter describes well a series of aspects of the war. Particularly interesting I found the one on the Commandos that were created also thanks to the help of an Italian, Dante Cesare Vacchi. Venter wrote a book that describes well and with great competence a little-known war. This isn't a huge book, but it gets through all the events and features plenty of illustrations. Al J. Venter is a specialist military writer and has had 50 books published. He started his career with Geneva’s Interavia Group, then owners of International Defence Review, to cover military and related developments in the Middle East and Africa. Venter has been writing on these and related issues such as guerrilla warfare, insurgency, the Middle East and conflict in general for half a century. He was involved with Jane’s Information Group for more than 30 years and was a stringer for the BBC, NBC News (New York) as well as London’s Daily Express and Sunday Express. He branched into television work in the early 1980s and produced more than 100 documentaries, many of which were internationally flighted. His one-hour film, Africa’s Killing Fields (on the Ugandan civil war), was shown nationwide in the United States on the PBS network. Other films include an hour-long programme on the fifth anniversary of the Soviet invasion of Afghanistan, as well as AIDS: The African Connection, nominated for China’s Pink Magnolia Award. His last major book was Portugal’s Guerrilla Wars in Africa, nominated in 2013 for New York’s Arthur Goodzeit military history book award. It has gone into three editions, including translation into Portuguese.